Benjamin Cluff, Jr., was born February 7, 1858 in Provo, Utah to Benjamin Cluff, Sr. and Mary Ellen Foster Cluff. His father was a mechanic and carpenter, and his mother was a pioneer of 1852. When Benjamin Jr. was seven years old, he traveled to the Sandwich Islands -- now Hawaii -- to join his father who was on a mission there. Benjamin lived in Laie for five years. He quickly learned the Hawaiian language. He assisted in building the first sugar mill and participated in the manufacturing of sugar. He also helped pick the first cotton crop grown in the islands. The islanders and the Indians fascinated young Benjamin, and he formulated Book of Mormon research to test whether there was any truth in his theory of emigration from the mainland to the islands of the Pacific. Ethnology and archeology came to life for the young scholar. When he was twelve years of age, Benjamin Jr. returned to Logan, Utah to help his father in the carpentry business. He didn't like attending school until, at the age of fifteen, a sudden change in attitude set him on a search for knowledge and an education. At seventeen his uncle, William W. Cluff, then President of the Summit Stake, invited Benjamin Jr. to come to Coalville, Utah where the young man worked in the tithing office and in the post office for two years. He also became librarian of the Coalville City Library and delighted in the opportunity to peruse the books held in the library. Surrounded by knowledge and thirsting for more, he decided to travel to Provo, where he hoped to attend the newly established Brigham Young Academy. In May of 1877, undeterred by the 65-mile distance between himself and campus, Benjamin Jr. set out for Brigham Young Academy on foot. He carried only an umbrella and a small bundle of clothing. After stopping overnight to visit an uncle on a ranch between Park City and Kamas, he got a ride just outside of Park City, and soon the nineteen-year-old man arrived in Provo. Harvey H. Cluff, a director of the new Academy, introduced the young man to its brand-new principal, Karl G. Maeser. The principal reportedly shook Cluff's hand and gave him a warm greeting. "It is an honor and a pleasure to meet and welcome into our school a young man with an ambition to fit himself for service in God's kingdom," Maeser said. "You will be happy here." The young man dedicated himself to attend the Academy, which was then located in the Lewis Building, but the first school year was just three weeks from closing. During the summer he was employed hauling coal and supplies between Provo and Coalville. His father offered him a one-third interest in a good farm in Wasatch County, but the son told his father, "If you release me to go to school, I will never ask you for assistance." The next morning Cluff was in Provo and began attending BY Academy classes. It was the fall term of 1877, and he was hired as a part-time janitor to help him with his expenses. Benjamin Jr. excelled as a student, and was invited to become a member of the Normal Class. Soon he was appointed a teacher in the BY Academy Primary Department. He studied school organization and continued with his education until one day Principal Maeser called him to his office and informed him that the Church needed missionaries in the Islands. Cluff had lived there, and still spoke the native language. Benjamin wondered aloud if he should not first finish his schooling, but Principal Maeser assured him that his schooling was primarily intended to prepare him for a mission, and that his mission would prepare him for life. Though the call was unexpected and school was just starting, he left in October of 1878, served a successful mission in Hawaii, and returned to Brigham Young Academy in 1882. He graduated from the Academy's high school in the Class of 1883. He returned to Provo and Brigham Young Academy, where he was employed as an instructor. He joined the faculty along with former fellow Academy students, James E. Talmage, Joseph M. Tanner, and Joseph B. Keeler. On Sunday evening, January 27, 1884, a fire, which started in the chemistry lab, completely destroyed the Lewis building. The Academy moved into temporary quarters, including Provo's ZCMI warehouse. In August of 1884, Benjamin married Mary Jane John, the daughter of President David John, and was appointed Stake Superintendent of the Young Men's Mutual Improvement Association (YMMIA). Benjamin Cluff's education and mission experiences had given him a deep desire to further his education. In 1886, he requested and received a leave of absence from his teaching responsibilities. He made the trip to Ann Arbor, Michigan where he enrolled in the University of Michigan. There he purchased a coal oil lamp and began to study. He received his bachelor's and master's degree from this university. At the University of Michigan, Cluff distinguished himself as a scholar. He polished his skills in writing and debating by defending the doctrines of the Church of Jesus Christ of Latter-day Saints in print and in open forums. While in Ann Arbor he debated before the student body a question of national interest, "Resolved, that Utah is ready for Statehood." That experience made him a marked man, and many challenges were hurled at him as long as he was on campus. He accepted as many debates and conferences as his schooling permitted. He graduated in the upper brackets of his class with a B.S. degree in 1890, one of the first Utahans to earn a degree from an eastern university. Cluff formed a close friendship with the president of the University of Michigan at that time, James Burrill Angell. This association influenced and enhanced his views on the future of higher education. While at the University of Michigan, Cluff was also exposed to the works of several of the most influential educators of his time, including Charles W. Eliot, John Dewey and Aaron B. Hinsdale. He became determined to bring many new educational ideas back to Brigham Young Academy and use them to strengthen the academic reputation of his young alma mater. In 1890 Cluff returned to Provo and Brigham Young Academy, where he was employed as an instructor in Mathematics. He was also appointed assistant principal. Between 1883 and 1903 he taught Primary Education, Mathematics, Psychology, Bookkeeping, and Didactics. In 1891 Professor Cluff launched a summer school designed to provide in-service training for teachers in the region. The instructor of the Summer School was to be a prominent educator. Colonel Francis W. Parker of the Cook County Normal College was the first instructor in 1892. Other instructors included James Baldwin from the University of Texas, and Burk A. Hinsdale from the University of Michigan. Cluff actively encouraged educators to come to Utah and share their knowledge with the students and faculty of Brigham Young Academy. In 1885, following the fire that devastated the Lewis Building, The Academy rented the upper story of Provo's ZCMI warehouse for the temporary use of the Academy. About the same time, a city block of land on Fifth North was purchased, and a large foundation was laid, only to lie dormant for seven years for lack of funding. When Benjamin Cluff returned from Ann Arbor, he became a vigorous leader in planning and working to complete the new building. By the late fall of 1892 the second and third stories were completed. Members of the Academy's Board came forward and mortgaged their own private property to aid in completing the facility. The curriculum for a four-year high school was designed, and in January of 1892, the school moved to its long-awaited new quarters. When the new Academy Building was dedicated on January 4, 1892, the principalship of the Academy formally passed from Karl G. Maeser to Benjamin Cluff, Jr. It was a memorable occasion and an estimated 1,000 people from all over the Utah Territory participated the ceremonies. At the time, beloved leader Karl G. Maeser said of himself and the new building, "The old man taught in a cabin, but they have built a palace for his boys." But when the dedicatory services for the Academy Building had ended, Benjamin Cluff, Jr., turned his full attention to the hard realities of his new position. Cluff lengthened class periods from half an hour to one hour, increased expectations of the faculty, increased the reading and writing requirements expected of students, and added new courses to the curriculum, including psychology, a subject new to western academia. He made every effort to organize the school as a leading normal training institution -- preparing LDS teachers for employment throughout the Church -- with full courses in kindergarten, primary, academic (high school), commerce, and missionary divisions. Much of this academic planning came directly from Benjamin Cluff. Even at this early date it was obvious that Cluff was working toward the goal of transforming the Academy into both a secondary school and a school of higher education -- a goal that was realized eleven years later in 1903. Upon being named Principal, Cluff had immediately identified three main problems that faced the Academy, and he began to work with his faculty, Board and Church leaders to solve them. The first problem was the emergence of a rival proposal to establish a university in Salt Lake City which would serve as the center of the Church's educational system. Cluff felt this move was a serious threat to the support and even the survival of Brigham Young Academy in Provo. The second problem was the alarming deterioration of the financial condition of the school during the last years of Principal Maeser's administration, significantly precipitated by the expense of the new building. And third, Cluff knew that in order to improve the scholastic standing and educational program of the Academy, he would need to seek and win greater and more dependable support from the General Authorities and the General Board of Education of the Church. The most serious of the three problems was the worst financial crisis in the history of the Academy � even worse than the many crises that had plagued the Maeser administration. 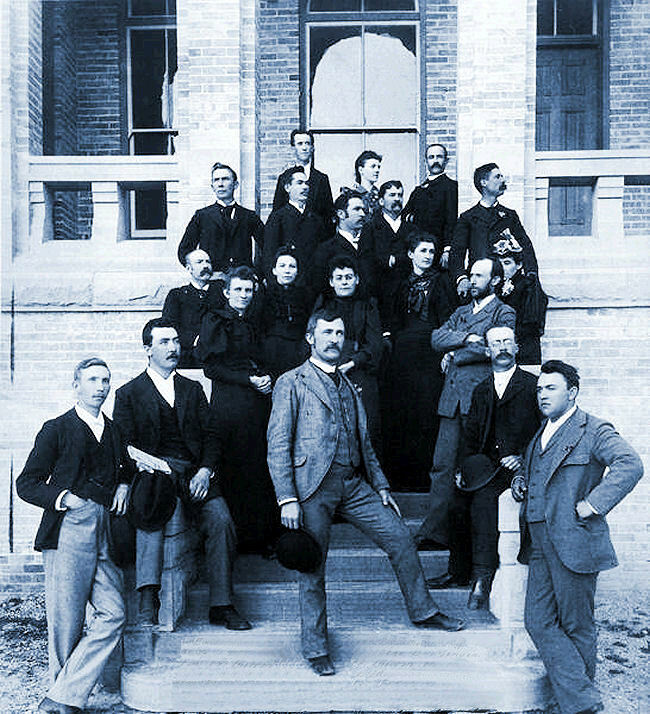 The leaders of the LDS Church became very aware that the Church needed acceptable, educated leaders, and at their urging, Professor Cluff readily accepted the opportunity to return to Michigan in 1893 to obtain a Master's Degree, and then tour the leading schools in the northern U.S. and parts of Canada to obtain guidance for building the Provo curriculum. From the beginning, Brigham Young Academy was an independent private school. It was not officially sponsored by the LDS Church. It is true that it received some sporadic income from the charitable donations of private individuals and various LDS wards and stakes, and a small income from student tuition, but a significant factor was the sacrificial service of the faculty, many of whom survived by farming, and were paid little or nothing. Cluff soon came to the conclusion that the only real solution to the school's many financial problems was for the Academy to seek and obtain the official sponsorship and financial support of the LDS Church. He wrote that "one evening while returning from a walk down town and while studying deeply over the future of the Academy, the thought came to me like an inspiration: 'Give the school to the Church.' Immediately my mind was at rest. I knew that it was the right thing to do." Although similar suggestions had been made and rejected a number of times in the past, on July 18, 1896, he formally requested this action, and this time the Board of Trustees officially agreed to incorporate the primary, middle and high school, and the institution was adopted as an official educational institution of the LDS Church. Regarding the use of the title "Principal" and "President", on July 20, 1895 the BYA Board of Trustees determined that "Principal" would apply to heads of departments, and the title "President" would now apply to former principal Cluff, so he became the first President of Brigham Young Academy. Utah achieved statehood in 1896, and student registration was opened to non-Mormons for the first time. Cluff interviewed and hired the first non-Mormon to be employed on the regular faculty. Miss Abby Celestia Hale served for three years as director of the Elementary Training School. A teacher, she was the niece of Edward Everett Hale, US Senate Chaplain and author of the story, "Man Without A Country". Her work as adjudged to have achieved the highest standards. To further dignify the leadership of President Cluff, in 1898 the Board conferred upon him the degree of Doctor of Didactics. By the time Cluff retired on December 23, 1903, BYA had become BYU, he had served as the first President of the University for about six months, and the school had begun to resemble other young universities of that era. The practices and standards established during Cluff�s administration continued to play a vital role in the evolving history of what would become Brigham Young High School and Brigham Young University. He established the foundation for future accreditation of the University in the 1920s. President Benjamin Cluff, Jr. was followed by President George Brimhall in 1903. Brimhall had served as the fourth Principal of the Academy's high school program from 1895 to 1900. "Benjamin Cluff was a strong and resourceful leader who ranks among the leading educators of Utah," according to Bryant Stringham Hinckley, one of Cluff's former students, who graduated from BYA high school in 1885. "In his prime he was a man to be reckoned with - a good organizer, fearless, and aggressive," said Hinckley. � Brigham Young Academy was dissolved in 1903, and was replaced by Brigham Young University and Brigham Young High School. � Class periods were lengthened from one-half hour to one hour, allowing teachers to present more material in a focused time period. � Cluff initiated a summer school to provide in-service continuing education for teachers in the region, and imported leading American educators as instructors. � BY Academy started a formal missionary training program to enhance the effectiveness of new missionaries. � Cluff formed the Student Loan Association, making it easier for students to stay in school until they had completed their programs. � Cluff stressed higher learning among faculty and students; many went east or to California for additional education. � Intercollegiate athletics were introduced to BYA, generating media attention and increased alumni loyalty. � The Athletic Association was organized, promoting safety and academic standards for athletes. � The Academy adopted school colors � blue and white � the first educational institution in Utah to do so. � Annie Pike Greenwood wrote the "College Song." � Class leaders were elected by students, beginning with the Class of 1891. Classes also selected mottos, class colors, and created class banners, fostering lifetime friendships. � Cluff instituted Founders Day, featuring concerts, dances, parades, ball games, athletic meets, cross-country races, and academic processions. � The school's first viable newspaper, the White and Blue, began publication. It became a vehicle for many types of progress. � Cluff persuaded leaders of The Church of Jesus Christ of Latter-day Saints to incorporate BY Academy as an officially sponsored organization of the Church, and eventually, to add a university to the school. � The Alumni Association was organized, and it began to hold annual dinners and maintain historical records. � Several new facilities were endowed, including the Holt Laboratory of Physics, the Magleby Laboratory of Chemistry, the Hinckley Laboratory of Natural Sciences, the Beckstead Laboratory of General Mechanics, and the Warren Smith Library of General Science Works. � College Hall with its large auditorium, and the Elementary Training School Building with a gymnasium on its top floor, were built during his administration; the Missionary-Preparatory Building (later known as the Arts Building) was completed nine months after the end of his administration. � The student body grew from 386 to 825; the faculty increased from 28 to 57; and the library expanded from 1,053 to 5,432 volumes. By the time Benjamin Cluff, Jr. completed his tenure on December 23, 1903, the school had become Brigham Young University, and Cluff was its first President. At the request of President Cluff, the change from Brigham Young Academy to Brigham Young University, and Brigham Young University High School, took place on October 3, 1903. In the same year, the Board accepted the resignation of Cluff, and he was formally released on December 23rd, having served the school in various executive positions since 1882, and as President since 1892. 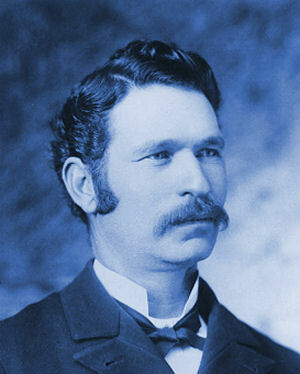 Benjamin Cluff Jr. possessed a lifelong desire to do archeological research to prove the veracity of the Book of Mormon. In 1900 President Cluff had been granted a leave of absence to lead a group of explorers on an expedition to South America. Travel to and from the Mormon colonies in Mexico was commonplace in those days, but Mormon exploration beyond the colonies was rare, and Cluff felt that this was the time to begin. On April 17, 1900, a group of well outfitted men left the Academy campus in Provo, led by a brass band and followed by most of the student body, on a march to Spanish Fork. There a grand reception was held, food was served, final speeches were made, and soon the little group departed to continue its trek to Mexico and South America. The full story of this expedition is full of adventures, successes and disappointments, but should be told elsewhere. President Cluff returned to Provo on February 7, 1902, disappointed and without the archeological evidences that he had sought. However, a naturalist on the expedition, Chester Van Buren, went on to Columbia, South America, and remained in the jungles until 1903, returning with some 1200 birds, snakes, mammals, Indian patterns, etc., to fill a museum on campus. This museum was established by Professor Van Buren, Professor Edwin H. Smart, and a student, George Talmage. For many years College Hall had a very lifelike exhibition of the Amazon jungle. After his retirement from BYU, Cluff pursued a life's ambition to find proof of Book of Mormon evidences, and study strata in Native American history. He paid all of his debts, gave homage to his colleagues, and moved his large family to Mexico. From there he established a rubber plantation, from which he hoped to launch additional efforts in ancient history. However, he experienced incredible hardships, placed his confidence in people who did not deserve it, and his plantation failed. He suffered massive losses from theft and deception. He eventually left Mexico for California, where he engaged in the grocery business, and served in the Church as occasion presented itself. One of the last Mormon polygamists, Cluff first married Mary Jane John [a BYA student] on August 16, 1883. He second married Harriet Cullmore on December 17, 1886. He third married Florence Reynolds in Mexico. Benjamin Cluff, Jr., died on June 16, 1948 in California at the age of 90 years. For distinguished service to the University, the Church, and his native state, the BYU Alumni Association conferred upon Cluff the Distinguished Service Award in 1946. The University further honored him by naming a new botanical building the "Benjamin Cluff Jr. Plant Science Laboratory", a nursery for the University's expanded landscaping and beautification program, and for the scientific research of three departments: Agronomy, Botany and Horticulture. The Benjamin Cluff Jr. Annual Lecture was established at BYU in 2003. It was designed to bring the nation�s top educators to the BYU campus to expose students to new ideas, and to foster a growing dialogue about how to make education better, an ongoing legacy of the first president of Brigham Young University. 19. Christina D. Young, and 20. Wilford M. McKendrick.